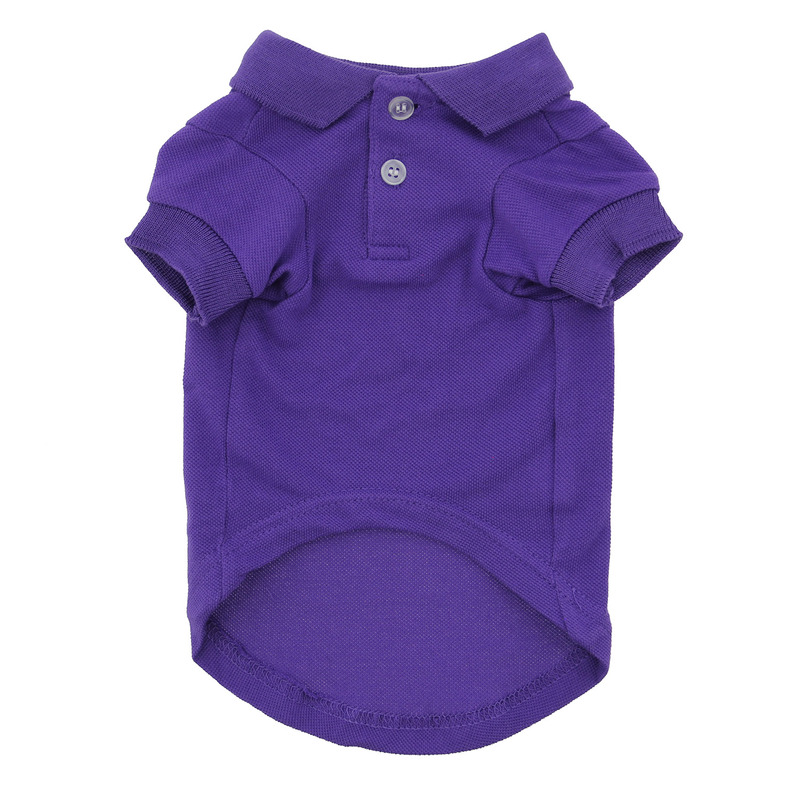 Your pup will look positively preppy wearing this classic Polo Shirt in Ultra Violet! 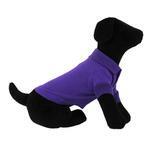 A Purple Polo Shirt is a staple item for your dog's wardrobe! 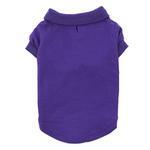 Our Zack & Zoey Dog Polo Shirt is a simple, tailored and sporty look for dogs. It's the perfect choice for dogs that want to look like royalty. As far as holidays, this polo is suitable for a classy Valentine's Day date when he's trying to impress! It's also a great choice for Easter and Valentine's Day. 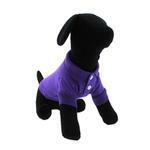 Our Ultra Violet polo is also the spot-on choice when your dog is manning the yacht or walking on the boardwalk. Polo Dog Shirt - Ultra Violet Customer Photos - Send us your photo! Dressed to impress in his new purple polo shirt. Cody is a toy aussie and loves to dress up. This is him in his Baxterboo shirt and tie for the horse races in Aiken. Purple is his favorite color. Rocking my new polo shirt from Baxterboo! What do you guys think of this color on me? Fenway Bark just celebrated his second birthday. He wore this outfit for his party. Stuart loves this polo. It fit him perfectly and was soft and stretchy enough for him to play around in. It also makes him look a little gentleman which I love! Wearing my very preppy golf shirt for country retreat. Notice the turned up collar. So very preppy and keeps me from scratching my hot spots! Mr. Knightley is all dressed for a weekend in the country in a very smart gold shirt. Dressing up is fun brings out my good looks!!!!! I love my new ultra violet polo from BaxterBoo!!!! Milo also just got his polo for his first birthday that is coming up on the 29th of March! A few weeks ago milo went blind and had to have cataract surgery, which is why he is shaved around his eyes and arm. He is better now and can see for his first birthday thankfully!! Paddi's signature color - purple! Diego sporting his new polo! Sacha loves her "Polo Shirt" so much we had to buy one in every color! Great Quality!! Too cool in the purple polo! Braxton, always a team player! I can't get enough of these shirts! LOVE these! My cat looks especially cute in this color shirt! He seems to enjoy all the clothes we buy from Baxter Boo! My chihuahua loves Baxter Boo too! Posted On 09/12/16 by Tasha B from , Yes, Tasha B recommends this product! This shirt looks nice on my dog. I will be ordering more colors. Posted On 01/23/16 by diana F from Largo, FL Yes, diana F recommends this product! I LOVE this shirt on my little puppy SPIRIT! My husband has a polo just like it and when they wear them together they are the cutest couple in town. It is well made, fits like it was handmade for him and he loves to wear it. Baxter Boo Rocks!! Posted On 01/17/16 by Jesse S V from SUN LAKES, AZ Yes, Jesse S V recommends this product! Great fit for our Maltese. Really enjoying his new shirt. Posted On 09/09/15 by Marie S from Doylestown, PA Yes, Marie S recommends this product! Posted On 03/23/15 by Deborah G from , MS Yes, Deborah G recommends this product! I loved the color on this polo. The fabric is nice quality. The fit is great also. My dog seemed very comfortable wearing it, even though he is not always good with wearing clothes. It is a good basic polo that could be decorated easily. I think I am going to have my dog's name embroidered on the back. Good job Baxter Boo. Thanks!! Posted On 01/20/15 by Nancy P from Tampa, FL Yes, Nancy P recommends this product! Bright, sturdy and thick material that washes well and is true to size. Posted On 11/07/13 by Toni S from , TX Yes, Toni S recommends this product! Tt will be matching from her bow, to her collar, to her shirt! Love it! Posted On 11/07/13 by Karen Cone from Tallahassee, FL Yes, Karen Cone recommends this product! Luna (the chihuahua) has several of these Baxterboo.com polo shirts in all the bright, pretty colors! Just plain necessary for a complete wardrobe. Great length and good fit. Love Baxter Boo's quality, prices and super quick delivery. Plus I love the "Thank You" & smiley face on the shipping receipt!